Hey, check out that frog! No, not there. That's a leaf. No, that's another leaf. Look! Where I'm pointing! Close... Almost... Next to that leaf. Other side. That's it! What? It's a leaf? Really? Whoops, I could've sworn it was a frog. 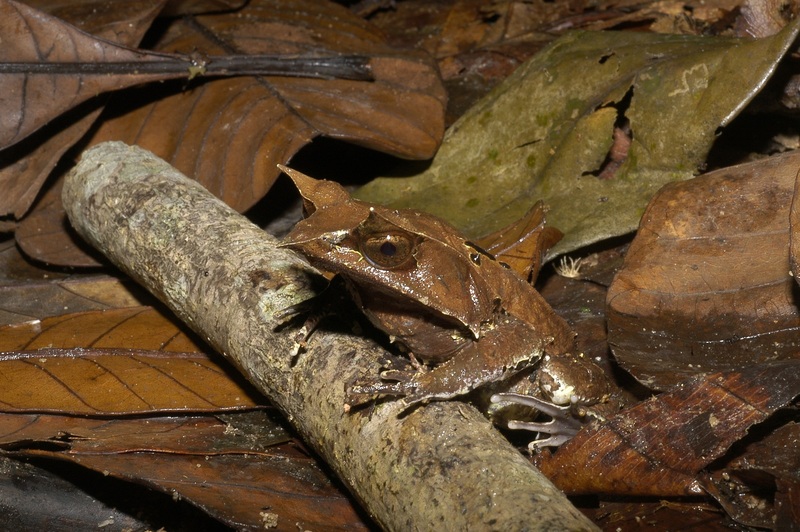 Malayan Horned Frogs are masters of disguise. They live on the forest floor in various parts of southeast Asia, where they completely disappear amidst the leaf litter. The species is extremely variable in colour. Or to be more precise, they're extremely variable in brown. They do ALL the browns, and are covered in various dead-leafy blotches and patterns. And then of course there are the sticky-out bits! A horn above each eye and one on the snout. Skin folds above and below the eye make them look a bit like origami, but mostly like a dead leaf. With this camouflage they can hide from predators and prey alike. They catch their food by suddenly leaping on any small creatures that wander too close. 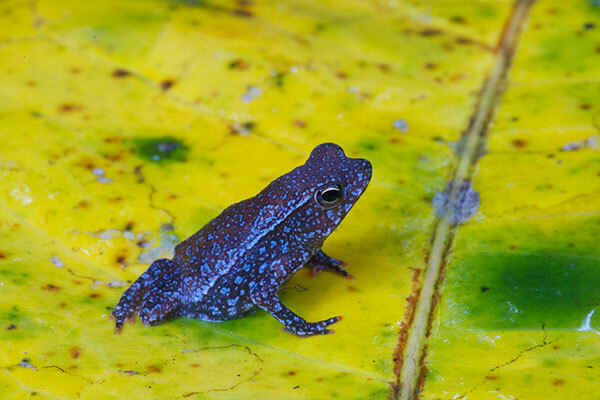 These frogs are up to 12 cm (5 in) long, so their meals include smaller frogs and lizards as well as insects. This oddity is about 6 cm (2.4 in) long and is one of the 6 species in the South American genus Hemiphractus. It looks like a cat! However, from a different angle they can look positively ghoulish with their massive feet, pointy snout, devilish horns, jagged skin and slit pupils. It's like some nightmarish gremlin who comes out at night to make your computer run slightly slower than the day before and make all the wires in your house get mysteriously tangled up. 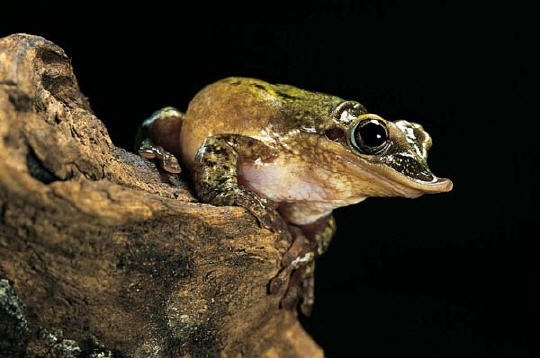 When threatened, Horned Tree Frogs open their mouth to show off their bright yellow tongue. If you look closely, you may see another surprise... a pair of fangs on their lower jaw! They aren't really teeth, more like bits of (sticky-out) bone, but they're still one of the only frogs with any teeth-type-things of any kind! They're also devoted parents. The female attaches several large eggs onto her back and carries them around wherever she goes. They skip the tadpole stage so when they hatch she has a pile of little, baby frogs clinging onto her! Here's something a little more bright and cheery! 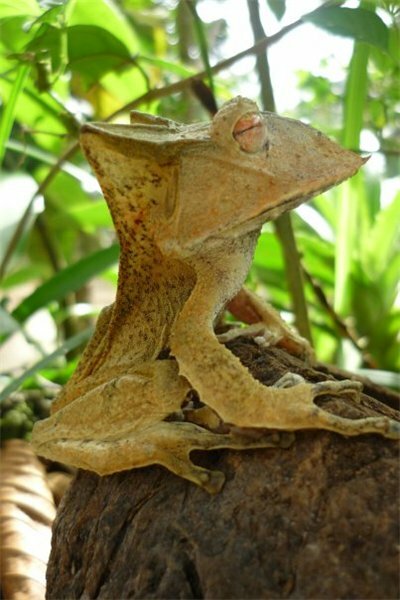 These tree frogs reach 8 or 9 cm (3 to 3.5 in) long and live high up in the trees of the Amazon. They can be green, blue or sometimes purple in colour, but they always have those funky yellow blotches on their sides. The Fringe in question are flaps of skin that adorn their legs. It makes them look tremendously muscular! I presume it's more of a camouflage thing, perhaps for covering up those vibrant yellows when they want to sit on a leaf and hide. Well, this is altogether more solemn! Perhaps that's not such a surprise, since a mitre is the headdress worn by the pope and various other Catholic and Orthodox fancy-dans. And with the customary toadish facial expression we can see that this is one grumpy bishop! 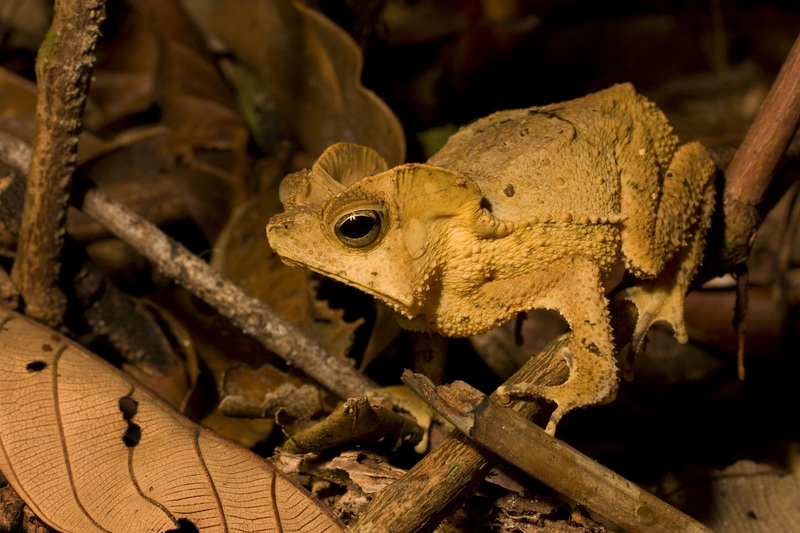 The thing about Rhinella margaritafera is that it isn't a single species at all, but a whole bunch of closely related ones in what's known as a "species complex". In this particular case no-one has yet done the work to find out exactly how many species there actually are. There's probably quite a few since they can be found throughout the Amazon basin, which is most of the top half of South America. 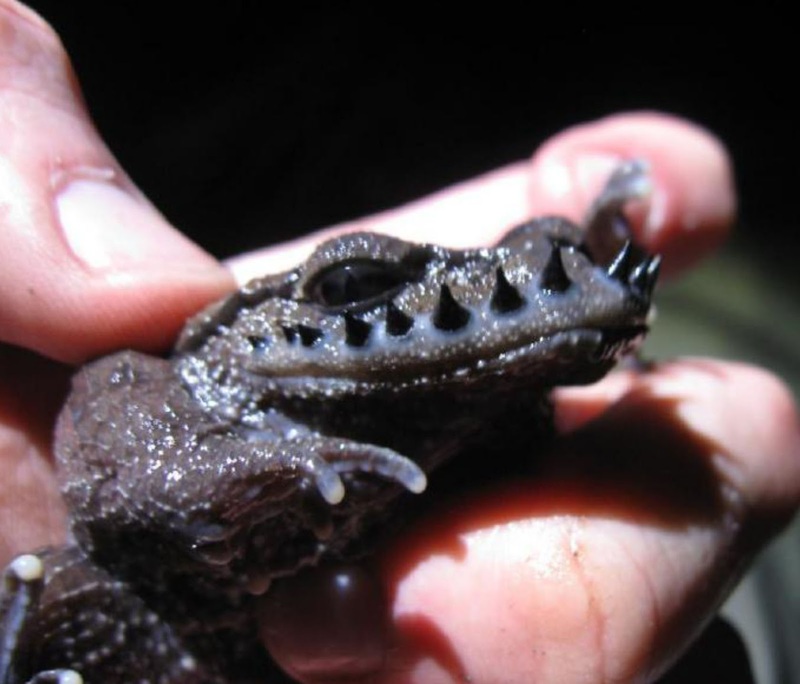 With this in mind it's no surprise to find that Rhinella margaritafera takes on many forms. 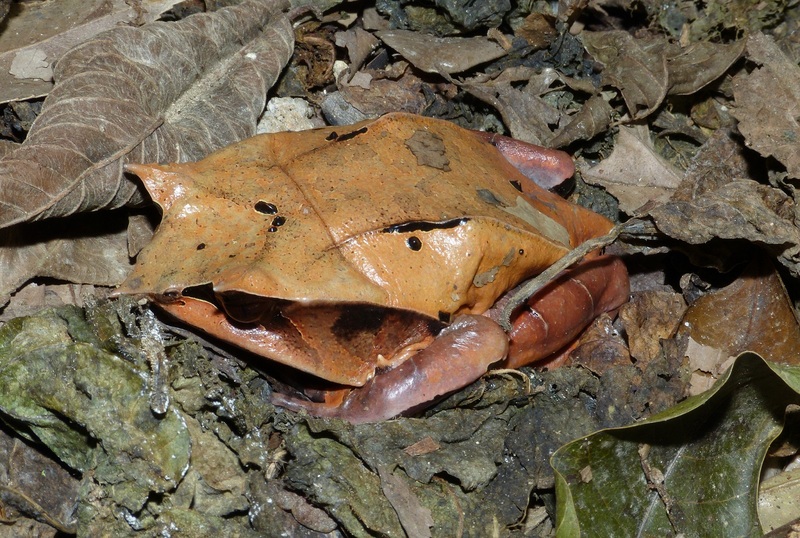 There are brown ones that are well camouflaged in the leaf litter but there are also white ones and even blue ones. They can be covered in patterns or stripes or be completely plain. And only some of them have that Dilophosaurus headgear! That's why the more normal ones are simply called South American Common Toads. Here's another headdress! 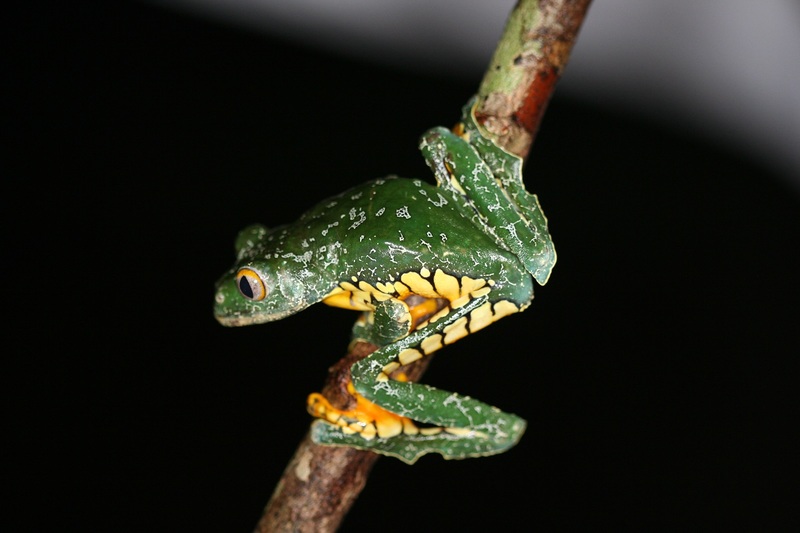 This time on a tree frog from Central America. This hat is perhaps not as impressive as the mitre, it being a collection of pointy lumps sticking out of its head for no apparent reason. Still, look how chocolatey this frog is! It looks like chocolate sauce drizzled over chocolate ice cream. That earns many points in my book. Many points. Here's some kind of duck-billed tree frog from Mexico. I really have no idea why it looks like this. It's just a whole lot of schnoz for no apparent reason. I can't complain. I do so like a bit of schnoz! Even if it's just some weird, fashion thing. Males construct underwater nests in the river valleys of a few mountainous parts of western China. They then stand, completely submerged in water, and begin calling for a mate. Sometimes a male comes along instead, seeking to muscle in on his territory. The male toads have not only grown an impressive set of strong, keratinised spikes, their arms have also grown extra thick and strong. They fight, each trying to grab hold of the other and stab him in the guts with his upper lip. Whoever wins gets to take over the nest and any eggs within it. A newcomer who successfully takes over a nest doesn't destroy the eggs that are already there, they seem to serve as good advertising of his prowess to other females even he didn't fertilise them himself. With all this fighting for good nest sites males have had to grow big to compete. They reach about 7.5 cm (3 in) long, which doesn't sound like a lot, but it does make them larger than the females. That's very unusual for frogs. Hey, it's a big, fat frog. 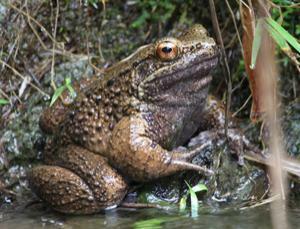 A classic, brown frog hanging out on a river bank, just like frogs were always meant to. But this frog, found only on two, small Japanese islands, holds a secret. While virtually every single other frog and toad in the world has four toes on its front foot, this one has a fifth digit known as a pseudothumb. A big spike! Both males and females have this thing but the male's one is larger and the female doesn't seem to use hers at all. The male may occasionally use his spike to fend off predators (or at the very least one, curious scientist), but they usually use it against, yes, other males. During the breeding season the fellas pull out their spines. In order to do that they already have to puncture their own skin because the spine is completely enclosed in the flesh of their hand. Usually. Then they stab each other for about 15 minutes until one of them walks away bloody and scarred. The victor, who is probably also bloody and scarred, then jumps on a female in the embrace known as amplexus which is common among frogs. 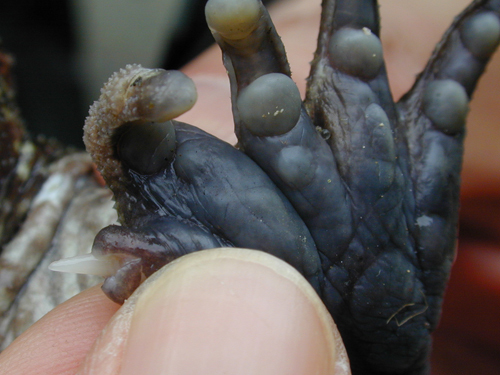 He finds it difficult to hold on, so he stabs her in the sides with his thumb spikes so he can get a firm grip. Perhaps it isn't really love unless absolutely everyone is bloody and scarred. Looking like some poor, scarcely living survivor crawling out of a nuclear explosion, this tree toad is one of several discovered during a 2009 exhibition to Tanzania, east Africa. Those huge, brightly-coloured boils are massive poison glands. They look like they wouldn't so much secrete poison as explode in a puff of plague. Species of the genus Nectophrynoides are interesting even when they're not bursting with barely contained pestilence. They produce live young. 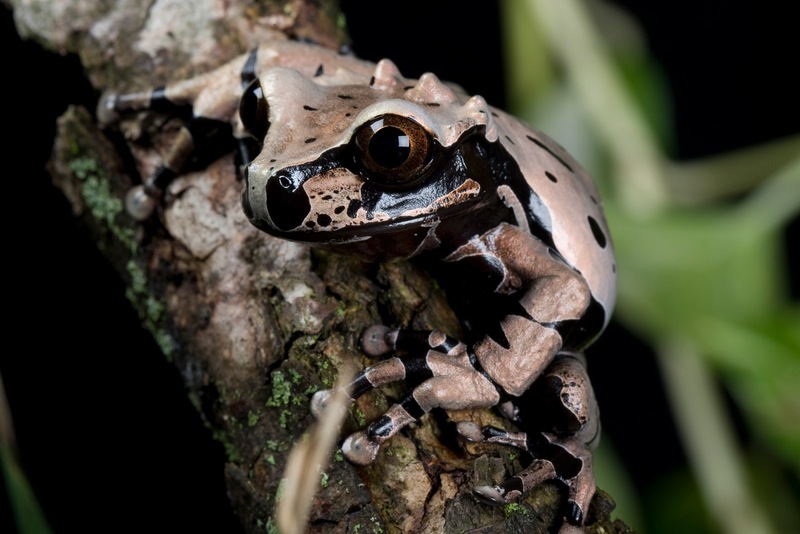 The female retains her eggs within her body and gives birth to tiny, baby frogs! 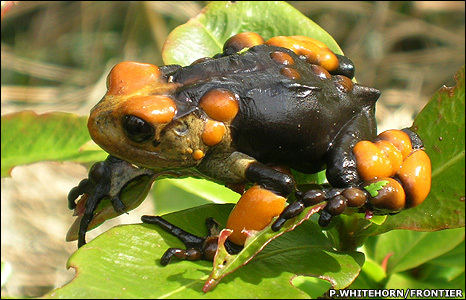 Finally we have what is sometimes called the Titicaca Scrotum Water Frog. How's that for sticky-out bits! They live in Lake Titicaca, which is a huge lake in the Andes on the border between Bolivia and Peru. It's over 100 miles long and 50 miles wide and it's surface is 3,800 metres (12, 500 ft) above sea level. Breathing is not so easy this high up and the Titicaca Water Frog needs a lot of oxygen because with a length of up to 14 cm (55.5 in) and almost no lungs at all, it's one of the biggest, fully aquatic frogs in the world. Gills would have been nice, wouldn't they? I guess that wasn't an option, so they had to go with skin. 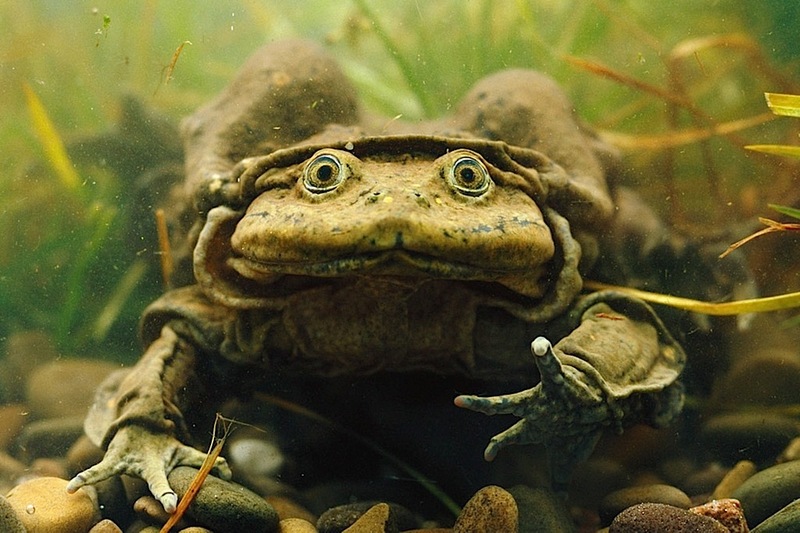 The Titicaca Water Frog breathes directly through its skin and in order to get all the oxygen it needs, it requires a sufficient surface area of skin. And that means lots and lots of skin. Other creatures might have developed a long, sinuous tail or elegant, fin-like structures. This frog decided it would be better to look like a ten year old got into his father's wardrobe. It's not so much a frog with sticky-out bits as a frog's head sticking out of a pile of skin. Frogs, the kings (besides insects/bugs/creepy crawlies, fish, and reptiles)of sticky out bits! @TexWisGirl: It would so cool to turn muscle-legs off and on! @Porakiya Draekojin: Haha! They're right up there! When all you have is a switchblade, every problem looks like a punk what needs shankin'. That's what my grand daddy always said. Your grand daddy was very wise! Or at least wily.